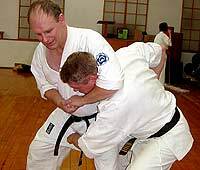 Many years ago, I discovered the answer within the karate kata I was practicing. 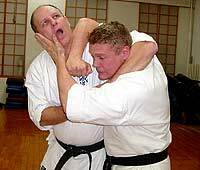 In the version of Seienchin kata we practice, before we go into the horse stance with the hand motion that represents this defense move against the headlock, there is another motion. (2) Before sinking back into a horse stance, the body is erect with one arm moving up and the other down. If someone grabs you, this double arm motion can be used to strike either side of the opponent's head (there are several variations). 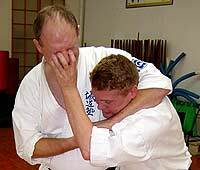 The first technique is a double palm strike, one arm going up (hitting the side of the nose causes great pain) the other down against the opponent's head that is tucked in close to yours (hitting to one side of the back of the head -- shocking the cerebellum and causing disorientation, momentary stunning and/or unconsciousness). 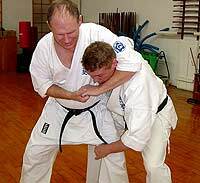 Of course, you will not be fully erect as in the kata since you have been pulled down, but the movement pattern is the same. Be very careful when practicing this technique. In the second example, the attacker had grabbed you securely, but has not yet sunk his head down to tuck it next to yours. Here again, your left arm moves upward, the palm striking the under edge of the opponent's jaw (on the left side), and your right arm moves downward, here the elbow striking down against the side of the opponent's neck (effecting the opponent's carotid sinus that helps regulate blood pressure, (3) the strike causing a momentary black out or stun) -- a devastating and very dangerous combination, never to be used unless your life is in danger. Other emergency options include a punch to the groin and/or a strike with the palm to the opponent's chin or nose. In the example, a nose strike is combined with a rake of the eyes with the fingers (also a very dangerous technique not to be used unless your life is in danger). The opponent's feet are also vulnerable. So a stamp to the top of the opponent's foot can be very effective and painful. Stamp with the ball or side of your foot, however, as the front part of the foot is less effective. Another technique is to use the heel to press down and then pivot your weight. This can cause extreme pain if done correctly against the right target -- one being on the outside of the top of the foot between the long bones that lead to the small and fourth toe. The pivoting action spreads the two bones. Some people will also grab you in a headlock in what can best be characterized as a playful test. People at work, roommates, family, friends or even someone you are dating will often ask, "what would you do if I grabbed you like this?" -- and then they grab you. They aren't serious attackers. 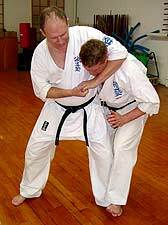 They know you are studying a martial art and want to test you or are using the grab to find out more about what you are studying. You don't want to hurt them. At the same time you don't want to seem incapable of defending yourself. Here a little pinch often works very well. See, the article "Ouch! - The Mighty Little Pinch For Self-defense" for details. Here I illustrate a pinch to the inner thigh of someone who has me in a headlock. This might not divert a serious assault, but a playful attacker or casual tester will most likely jump away from the sudden pain. The little pinch looks innocuous, but boy does it hurt! (2) In our version of Seienchin this move is done to both sides, but only one represents a defense against a headlock. 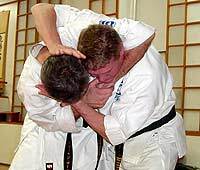 The follow up techniques on the second of these two sequences are different, resulting in an offensive move, rather than a defense to a headlock. (3) This is a section of the carotid artery that ascends on both side of the neck. Where it splits below the jaw line, about one and one-half inches internally under the sternocleidomastoid muscle (that runs from behind the ear across the side of the neck to attach to the sternum bone in front) is an area which can expand or retract according to the pressure of blood running in the artery. Along with several similar sinuses in the body, nerves in this area are affected by the stretching or condensing of the sinus and are used by the body to sense (and thus regulate) blood pressure. A strike to the side of the neck will put sudden pressure on this sinus (simulating a sudden surge of blood pressure) and the neurological system will immediately respond: blood pressure will suddenly drop for a short period, which can cause momentary unconsciousness or a stunning effect. Christopher Caile is the Founder and Editor-In-Chief of FightingArts.com. He has been a student of the martial arts for over 40 years and holds a 6th degree black belt in Seido Karate and has experience in judo, aikido, diato-ryu, boxing and several Chinese fighting arts. He is also a long-term student of one branch of Traditional Chinese Medicine, Qigong. He is a personal disciple of the qi gong master and teacher of acupuncture Dr. Zaiwen Shen (M.D., Ph.D.) and is Vice-President of the DS International Chi Medicine Association. In Buffalo, NY, he founded the Qi gong Healing Institute and The Qi Medicine Association at the State University of New York at Buffalo. He has also written on Qi gong and other health topics in a national magazine, the Holistic Health Journal and had been filmed for a prospective PBS presentation on Alternative Medicine. Recently he contributed a chapter on the subject to an award winning book on alternative medicine, "Resources Guide To Alternative Health."